Ready for a little abracadabra? Want to find out what the United States Postal Service has up its sleeve? It just might be a little magic. That’s the theme of a new five-stamp set that will magically appear Aug. 7 in Las Vegas, Nev. The nondenominated (50¢) The Art of Magic forever stamps will be issued in a pane of 20 with a first-day ceremony at the Orleans Hotel and Casino, 4500 W. Tropicana Ave., in Las Vegas. The ceremony is scheduled to begin Tuesday at 2:15 p.m. PDT. Although the event is free and open to the public, the Postal Service advises that it is a ticketed event, and adds that tickets are limited to first-come, first-served. The stamps will go on sale nationwide on the issue date. 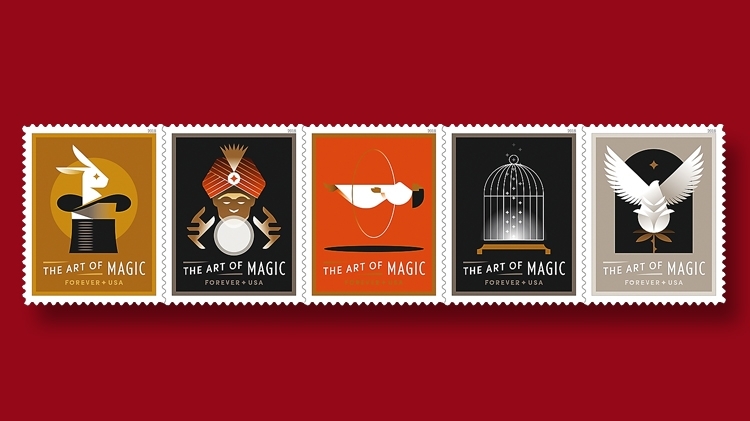 The Art of Magic stamps feature digital illustrations that depict “five classic tricks magicians use to amaze and delight audiences,” according to the Postal Service. The stamp subjects are a rabbit in a hat (representing production), a fortune teller with a crystal ball (prediction), a woman floating in the air with a hoop around her (levitation), an empty bird cage (vanishing), and a bird emerging from a flower (transformation). Each illustration is set against a simple one- or two-color background, with “The Art of Magic” lettered in dropout white below the artwork. “Forever USA” appears in smaller letters at the bottom of each stamp. The stamps were designed by USPS art director Greg Breeding with illustrations and typography by Jay Fletcher of J Fletcher Design. Banknote Corporation of America printed the stamps by offset, with a print quantity of 20 million stamps. Magic today is primarily viewed as a form of entertainment, though its practitioners throughout history have sometimes been shunned and denounced for their abilities. The stage magic celebrated on these new stamps has developed in the hands of well-known magicians who have astounded audiences for many years. Jean Eugene Robert-Houdin in France and Scotsman John Henry Anderson were two of the more successful early magicians who practiced their craft before paying audiences in the 19th century. Hungarian-born American illusionist and escape artist Harry Houdini became an international celebrity in the early years of the 20th century and was commemorated on a 37¢ stamp in 2002 (Scott 3651). Magical entertainment continues to enjoy great popularity, with top magicians entertaining crowds in clubs and arenas, on television and the internet. Along with the 2002 Houdini stamp, the U.S. Postal Service has paid tribute to magic before. A 2007 stamp set of four featuring animated stars was titled The Art of Disney: Magic, and shows Mickey Mouse as the sorcerer’s apprentice in Fantasia, magical friends Peter Pan and Tinkerbell, Dumbo the flying elephant with Timothy Mouse, and Aladdin and the magical Genie (Scott 4192-4195). And a 2013 issue chronicled the lengthy film escapades of the fictional young wizard Harry Potter on 20 different stamps issued in a single booklet (Scott 4825-4844). With five new stamps arriving on Aug. 7, the Postal Service hopes to keep the magic alive.